As two folks invariably obsessed with cooking at home, we don’t normally order Chinese takeout. 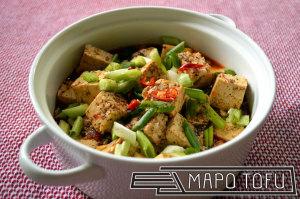 But when we do, mapo tofu is one dish that I’d be hard pressed not to ask for. It’s my addictively spicy yet savory, “always leaves your mouth buzzing thereafter” guilty pleasure. And why I was really excited to learn this dish. What I didn’t expect was such an odd (and borderline offensive) backstory to this famous Sichuan dish. The dish in its current form comes from the outskirts of the Sichuan city of Chengdu, where an old lady with facial deformations ran an inn. Travelers would come through the inn, and she would offer to cook their remaining ingredients – usually tofu and any sort of beef they had – together with whatever little of the local condiments she had into a warm and savory dish. 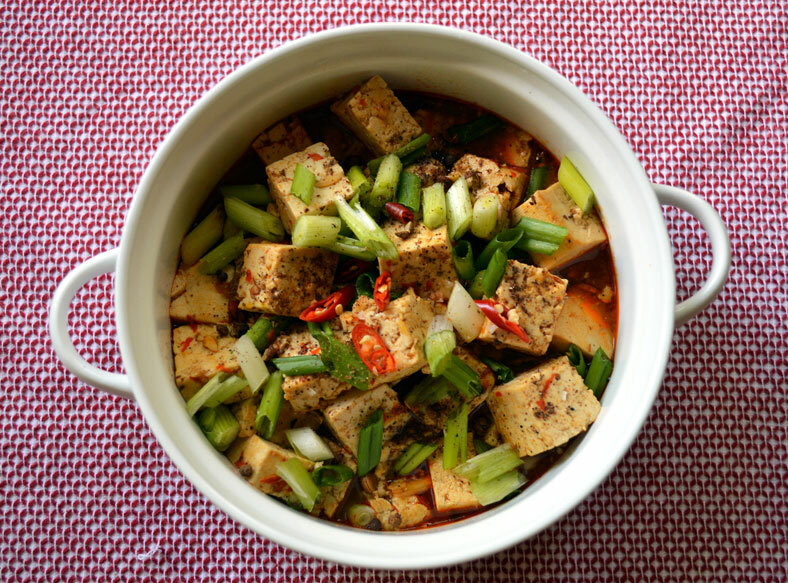 The dish became commonly known as “ma-po doufu,” or “pock-marked old lady tofu.” Go figure. 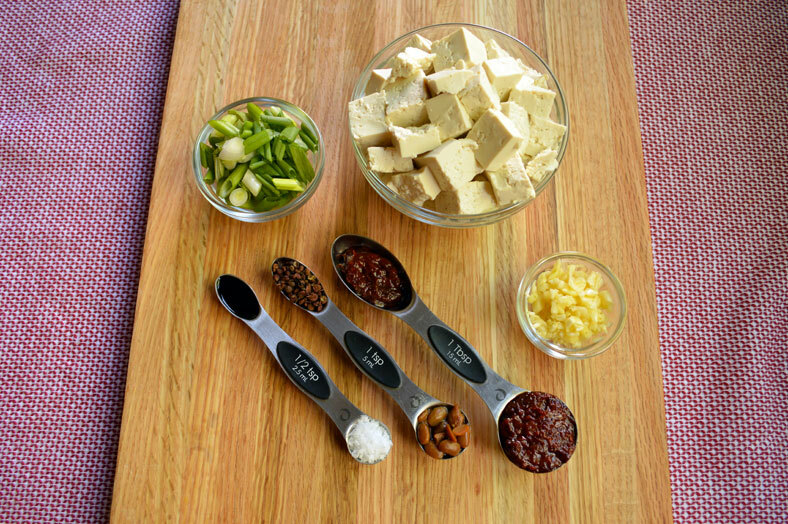 What makes mapo tofu so special is its incredibly simple yet sophisticated mixture of heat, savoriness, freshness, and even sourness all in one dish. And when meat is added (though you’ll see in our recipe we omitted it), you create yet another dimension of texture and taste. The star of the show, by far, in a dish like mapo tofu is the Sichuan peppercorns. They’re actually not cooked in the dish itself, but are added once everything is fully cooked and the wok taken off the heat. It’s from these tiny little peppercorns that you get the “mouth buzz” – the almost numbing effect that comes when you take a bite. For those first-timers to mapo tofu, don’t be alarmed when your mouth starts to tingle. Now you know, it’s part of the dish’s magic. For this recipe, we wanted to find a way to change the original recipe into a viable meat-free option for Heather to enjoy as well. 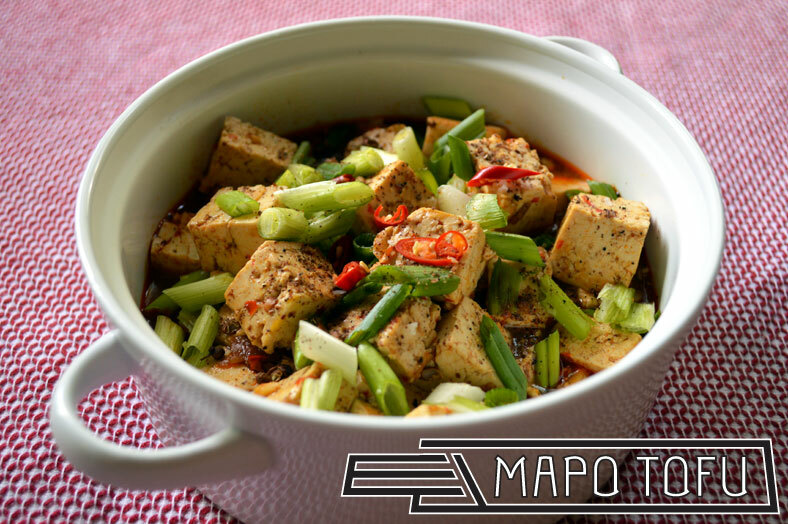 When researching possible options, however, we didn’t find any appealing options that wouldn’t otherwise compromise the authenticity of mapo tofu, so we figured to just omit the non-tofu protein from the original recipe altogether. Over the course of testing the recipe, we gradually swapped out several ingredients based on what we thought might be a healthier end result. Instead of cornstarch, we created the thickening slurry out of water and arrowroot powder. 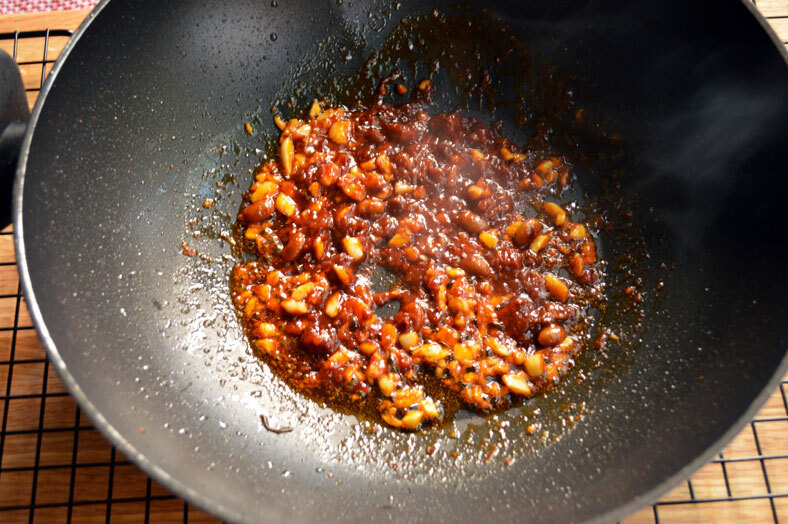 Instead of cooking with regular vegetable oil, we cooked with a mixture of coconut oil and our homemade chili oil. And more, because we had already had fermented soybeans on hand, we swapped the fermented soybeans in for fermented black beans. Another thing to really be on the lookout for is, if you’re going to use ready-made doubanjiang (chili bean paste), to be wary of what “extras” might be added to it. A lot of ingredients for Chinese recipes get a bad rap for containing a lot of unsavory additives like MSG and alike, so it’s just something to keep in mind. We found that the closest and most natural brand (and we learned the hard way…) is from Sichuan Dan Dan Seasoning. If you can find that brand of chili bean paste, you’re in luck! Surprisingly, the cooking process itself is pretty no-fuss. Once the wok is on and piping hot, you’re pretty much moving down the line of ingredients, adding one to the party every minute. 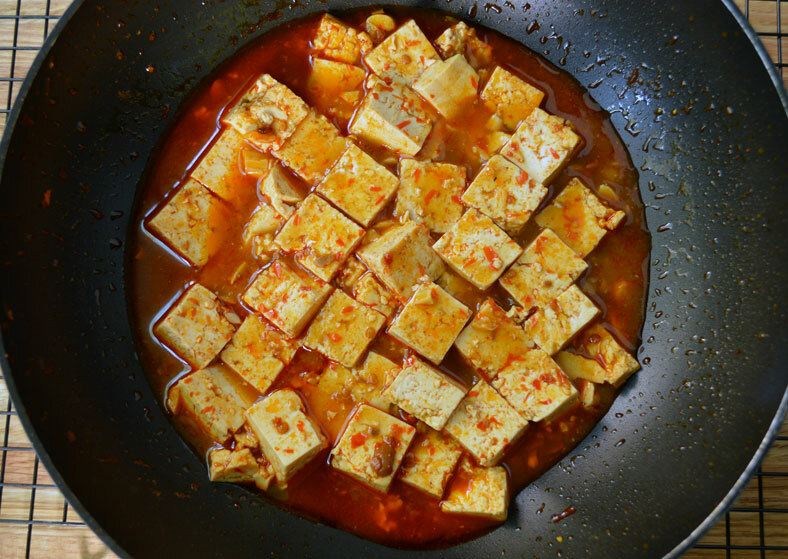 Getting the broth and the slurry to a boil might add another minute to the process, but you can cook mapo tofu from start to finish in no more than 10-15 minutes. More importantly, though, we were both pleasantly surprised at how, with the right ingredients, healthy mapo tofu can turn out to be without compromising the taste of it. And, of course, we loved the tingly sensation that from the Sichuan peppercorns. As always.